Whether you’re working with freshly roasted, leftover-from-Thanksgiving turkey or simply sliced turkey meat from your neighborhood deli counter, there is no better use for it than being put into a turkey club sandwich. A club sandwich consists of layers of bread, tomatoes, lettuce, bacon and turkey, with a little bit of mayonnaise to hold it all together. It’s a great combination and a very impressive sandwich the way it’s usually served: with three layers stretching far above the plate. 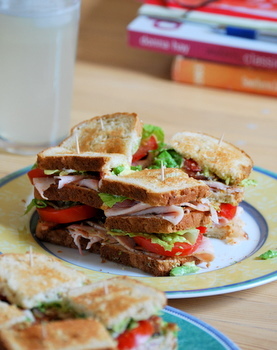 Although club sandwiches are most often associated with delis and diners, they are great sandwiches to make at home. The components are all things that we often have in our kitchens already (you keep bacon on hand, don’t you?). 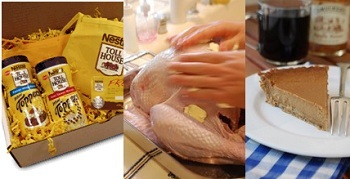 Freshly roasted, sliced turkey is going to make the very best sandwich so the day after Thanksgiving is the perfect day to make one. That said, go for good quality deli meat and you can still make this delicious sandwich any day of the year. There aren’t any tricks to making this sandwich perfectly as long as you use good quality ingredients and fresh, crispy toast. The only thing you can do to improve on that is to try and get your bacon as flat and crispy as possible, so it fits into the sandwich easily and adds crunchy contrast as well as flavor. Get thicker bacon if you can get it. Starting your bacon in a cold pan will help keep it relatively flat while you cook it, and in just a few minutes you’ll have perfect bacon for your perfect turkey club. This recipe doesn’t give you the proportions for the tomato, turkey or lettuce in your sandwiches, so simply adjust the amounts as you need to. Generally speaking, one of these big sandwiches will be enough for two people to split. Place slices of bacon in a cold frying pan. Turn heat up to medium-high and cook until bacon is golden brown on the bottom, then flip and continue to cook until crispy. Drain on a plate or cooling rack lined with paper towels. Place one slice of toast on your plate. Top with a layer of mayonnaise. 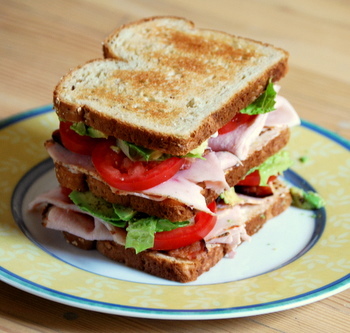 Stack turkey, 2-3 slices of bacon, 2 slices of tomato and a bit of lettuce. Place another slice of bread on top and repeat layers. Top with final slice of toast. Place one toothpick into each quadrant of the sandwich and slice into quarters; the toothpicks will hold the sandwich together while you serve. Previous PostPrevious Holiday Baking Giveaway! Yum! the sandwiches look delicious. 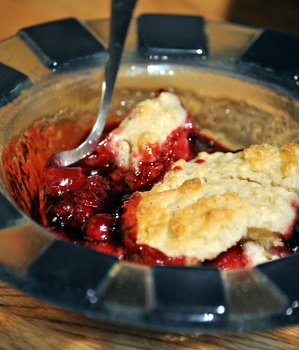 I think this was the first time I ever saw a “real” food on your blog. 🙂 A non dessert. great sandwich! i use to think sandwiches were boring, but there are endless ways to spice them up to deliciousness! It’s only early morning here in France but I WANT that sandwich NOW!! We’re celebrating Thanksgivine a week late with French and American friends so I kinda miss the ‘next day’ left overs– Thanks for this post!!! This makes me crave for a good sandwich, lovely!